I’m guessing if you’re reading this, you love your yoga class! It’s something you count on and look forward to every week, knowing that you’ll not only learn something about your body or how to nail that perfect pose, but also that you’ll feel so much better after your class and spending time with other people of like mind. Finding strength, flexibility, relaxation in a pose, or even nailing that perfect pose is not the exclusive domain of able-bodied yogis, although sometimes it sure appears that way. Twenty, even ten years ago, it was the rare exception to find a class that was inclusive of the disability community; yoga studios, usually located upstairs, were not accessible. 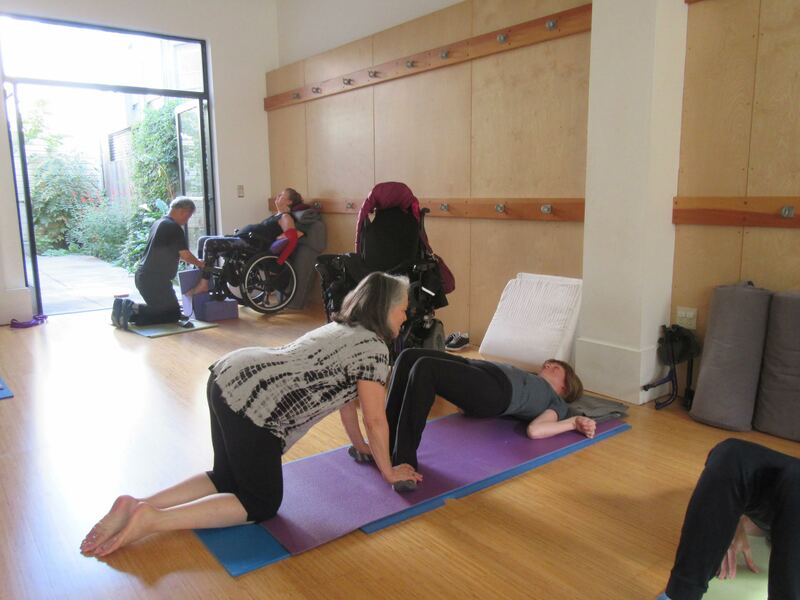 On April 1, 2001, Piedmont Yoga Studio opened its doors with an accessible studio on Piedmont Avenue and began offering classes for people with disabilities. My name is JoAnn Lyons and I was, and still am, the teacher of two classes each week that have lasted through ownership and name changes, as well as a new physical location of the studio. In order to provide a positive experience for students, I’ve been providing teacher trainings so that our students receive expert help when needed. Piedmont Yoga Community (PYC), a non-profit organization, was formed to support these classes, and to supplement payment to teachers for this important work, so the classes can be offered to our students on a sliding scale. These yoga classes for People with Disabilities are meant to be inclusive. No one is turned away because of race, color, creed, sexual orientation, gender identity, age, ability, disability or lack of ability to pay for the class. And therein lies the rub . . . PYC is asking for help from the local yoga community to support these classes. If you can make a one-time donation or, better still, commit to a monthly contribution, it would help PYC support this work. If you have other ways to help by donating your time and talent, please contact PYC. Here are some quotes from our students and assistants and their thoughts on how PYC has touched their lives. “Thank you for your wonderful class and your generosity and devotion to a group of people with limited options and a need for all the help they can get . . .” Joel B. “Thank you so much for doing this at an affordable rate . . .” ♥ Joan C.
“The class has helped me move closer to the life I desire – a life of being present, conscious and happy.” Patricia E. “In short, the class has a very cool vibe!” Melissa C.
“The community that inevitably develops in any class . . . keeps bringing me back.” Patrice W.
“Shared companionship and compassion before, during or after every class, making it very unique and gratifying.” Ramona A. “I feel so safe at your Yoga classes. The amount of personal, individual attention each participant receives is extraordinary in my experience.” Marty S.